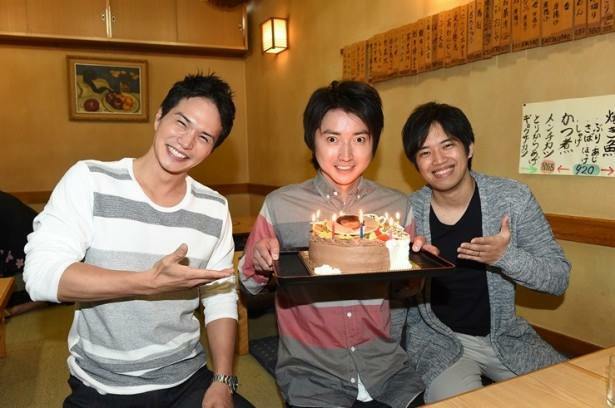 Shortly before entering the room, co-stars from Tatsuya’s new drama Reverse (リバース) laid out a surprise birthday cake (with his face printed on it) for him. Even though his birthday has already passed, they were not filming on that day (Tatsuya was instead attending the premiere of Memoirs of a Murderer) so the cast & staff decided to celebrate with songs and cake today. To commemorate the event, Tatsuya brought the cake (with lit candles) right under his face and held a powerful expression, illuminated by the flames, which made everyone laugh. The 6th episode aired tonight on TBS. Sidenote: In the article, they refer to Tatsuya as 座長 (Zacho) which means Chairman.